NASA announced the discovery of the planet Kepler-452b made using the Kepler space telescope. It has an orbit similar to that of the Earth around a star similar to the Sun. This puts it well within the habitable zone of its star system because the star Kepler-452 is just a little bigger and brighter than the Sun so if on the planet Kepler-452b there was an atmosphere similar to the Earth’s, water could exist in liquid form. The star system Kepler-452, that is about 1,400 light years from Earth, is about a billion and a half years older than the solar system since it’s about six billion years old. The planet Kepler-452b has a size that is approximately 1.6 times that of the Earth for a mass estimated at approximately five times that of the Earth. This means it could be a rocky planet of the type known as super-Earths. Its year lasts 385 Earth days. NASA’s announcement immediately sparked huge excitement in the media thanks to the similarities between Kepler-452b and the Earth. The planet has been called by many an Earth’s twin although actually there are several differences, including a much higher gravity. In fact, they’re not even sure that it’s a super-Earth. The characteristics of the exoplanets are only partly measured directly, using the shadow they create on their star when they pass in front of it. According to a recent research, many planets of that size turn out to be mini-Neptunes. The issue is further complicated by the possibility that planets similar to Neptune can get close to their star, lose much of their atmosphere as a result of the solar wind so that their rocky core remain turning then into super-Earths. 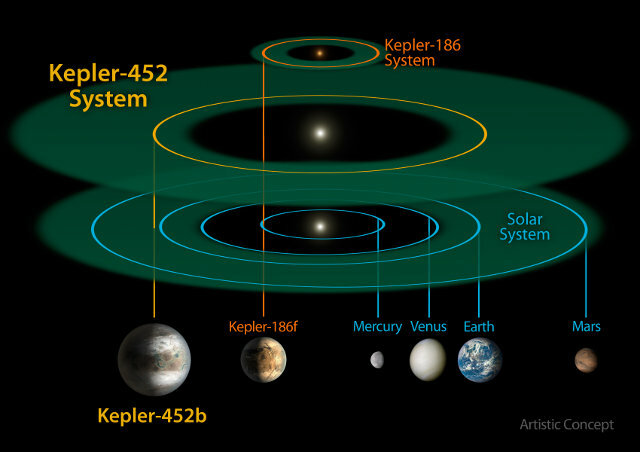 Some elements of Kepler-452b, starting from its mass, are determined using complex statistical models. However, when we talk about probability there’s inevitably a certain approximation. In essence, this planet could be a super-Earth, a super-Venus, a mini-Neptune or something else. Even if Kepler-452b was a super-Earth, the kind of atmosphere and chemical composition would have a considerable impact on its evolution. It’s clear that the discovery of a planet with an orbit similar to the Earth’s around a star similar to the Sun raises expectations but that’s not enough to say that there may be life forms on it. In the past, other interesting exoplanets have been discovered. At the beginning of 2015 the 1000th exoplanet discovered with the Kepler space telescope was announced and among those thousand there are various possible super-Earths in the habitable zone of their star systems. Aside from the big hype seen in the media, the discovery of Kepler-452b is still interesting. However, it will be necessary to wait for the availability of the next generation instruments in order to better examine this and other promising exoplanets and accurately determine some of their characteristics.